When you were a kid, people told you what to do. Later in life, the same. We don’t like to be told what to do. When we think about delegation, it comes with this baggage: that being told what to do is a drag. We only take it well from people we really respect. We don’t want to be that awful Do this! person, and we don’t want to be resented by people we’re delegating to. So, it’s easy to fall into the trap of not delegating enough. If you are a project leader or manager, then you’ve already been caught in the quandary of delegating vs. doing the work yourself. It’s risky to delegate because you, as a leader, are responsible for the work you assign to others. Delegating is one of the most difficult aspects of leadership because of the risk involved. When you delegate the assignment might take longer, it might not get done “right” or you could spend a long time explaining it, so doing it yourself can seem like the better choice. Doing it yourself is usually not the better choice. A project leader’s role is to keep the team effort moving forward, efficiently, toward the desired outcomes. That means figuring out who can do what, organizing work into chunks that can actually be undertaken, coordinating those pieces and bringing them together. 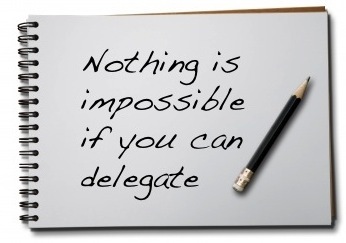 By definition, then, delegation is a must. Instead of thinking about delegation as telling people what to do, think about delegation as a form of empowerment. We don’t like being told what to do, but we like being empowered. When you delegate, you empower others by increasing their responsibility and you offer them the prospect of being rewarded for doing so. If team members do well, you recognize their good work. If they don’t do well, your job is to help them learn how they can be successful next time. When you delegate, you also empower yourself. The only way for you to take on more responsibility as a leader is to let go of work that can be done by others and focus on the work that is best handled by you directly. It might seem like a risk to ask Isabella this way. She might respond, “No, I can’t do it.” Well, if she doesn’t think she can do it, it would be the same if you told her rather than asking. It’s better to know right away if she thinks the assignment isn’t achievable. Making the request as a team need – not anything about what you need – gives her a sense that the work is part of a collaborative effort rather than the team leader telling her what to do. Whenever possible, align the work you are delegating with team members’ interests. People want interesting and challenging work, and our level of commitment is generally proportional to our level of interest. An engineer who reported to me had an enormous capacity for work. He was working on more than double the number of projects simultaneously that other engineers in the group were handling, yet he managed to get everything done on time. He told me he especially wanted projects that involved teaching others what he knew, because he had about 30 years of experience to share. Since I knew he liked projects that involved mentoring, I gave him more and more of those assignments – testing his capacity to get it all done. He managed to get even the lowest priority work done quickly because it was work he especially enjoyed. It’s easier to delegate assignments people want to do, but what if nobody really wants to do the work you need done? Then it’s a matter of delegating to someone who realizes the importance of the assignment and won’t be demotivated by doing it. You have to know your team members in order to assign work they like, to know who will do a good job, and to be confident they will be motivated even when the work is not so desirable. Knowing your people is key to delegating successfully and easily. Even when you know your team really well, there are still things you don’t know. There is some risk you need to accept as a leader when you delegate. There is the risk that people won’t like you because you buried them with more work, or they might not like the way you assigned the work. You might ask someone to do something they can’t do very well, and you don’t find out until after the work is done. You might delegate tasks they think are “beneath” them, or too easy, and it kills their motivation but they don’t tell you. Knowing your people is a leadership quality that helps a lot with delegating, but to really master the art of delegation and minimize the risks involved, you need to do more than just know your people. It’s also important to create an environment of open, honest communication. When people feel they can speak honestly about their enthusiasm for assignments and their confidence in meeting the objectives, you’ll know their level of acceptance and you’ll gain assurance in their ability to complete the work successfully. June 24, 2015 in Engineering Leadership. ← What is “Job Satisfaction” Anyway?